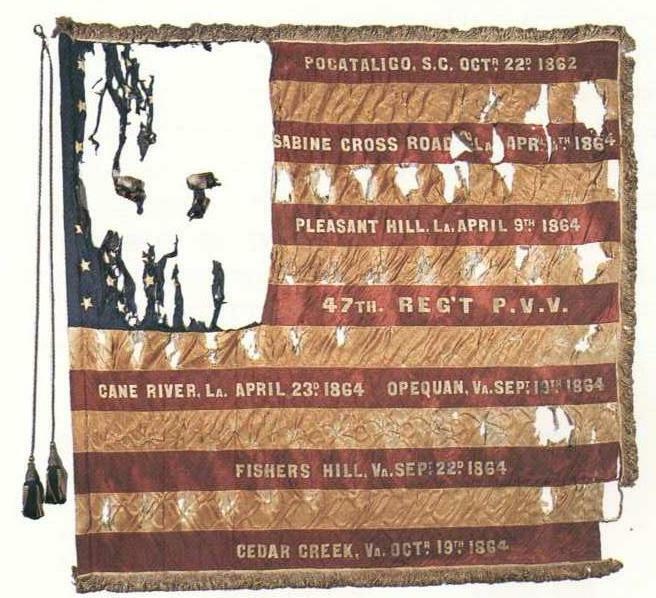 Second State Color, 47th Regiment, Pennsylvania Volunteer Infantry with stripe designating the unit as “P.V.V.” (Pennsylvania Veteran Volunteers”). Presented to Company C Captain Daniel Oyster, 7 March 1865. Those words above are at the very heart of what it meant when military units fighting for the Union during America’s Civil War were honored with the coveted and highly respected label of “Veteran Volunteer,” and further clarify the intent of General Order No. 191, which spelled out the expectations of the U.S. War Department for, and the benefits which accrued to, the individual soldiers and regiments ultimately awarded this designation. A literal “badge of honor,” the appellation “Veteran Volunteer” conferred upon its recipients the right to sew “volunteer service chevrons“ (or service stripes) on their uniforms and regimental flags, signaling to all whom they encountered that they were battle-tested, long-serving and long-suffering combatants dedicated to the fight to preserve America’s Union. In the case of the men who served with the 47th Regiment, Pennsylvania Volunteer Infantry, the designation was conferred most frequently in the latter part of 1863 and early 1864 during the regiment’s service in Florida. Assigned to garrison Forts Taylor and Jefferson in Key West and the Dry Tortugas, the 47th Pennsylvanians had already, by the fall of 1862, defended Washington, D.C. and played key roles in the capture of Saint John’s Bluff and Jacksonville, Florida, and had been severely bloodied during the Battle of Pocotaligo, South Carolina in late October of that same year. In addition to having completed their initial three-year terms of service by the time they re-enlisted in 1863 or 1864, many had also fulfilled their “Three Months’ Service,” having been among the first responders to President Abraham Lincoln’s initial April 1861 call for volunteers to defend the nation’s capital following the fall of Fort Sumter. I. The period of service for the enlistments and re-enlistments above mentioned shall be for three years or during the war. II. All able bodied men, between the ages of 18 and 45 years, who have been heretofore enlisted, and have served for not less than nine months, and can pass the examination required by the mustering regulations of the United States, may be enlisted under this order as veteran volunteers, in accordance with the provisions hereinafter set forth. IV. If the government shall not require these troops for the full period of three years, and they shall be mustered honorably out of the service before the expiration of their term of enlistment, they shall receive, upon being mustered out, the whole amount of their bounty remaining unpaid, the same as if their whole term had been served. The legal heirs of volunteers who die in service shall be entitled to receive the whole bounty remaining unpaid at the time of the soldier’s death. V. Veteran Volunteers enlisted under this order will be permitted at their option to enter old regiments now in the field, but their service will continue for the full term of their own enlistment notwithstanding the expiration of the term for which the regiment was originally enlisted. New organizations will be officered by persons who have been in service and have shown themselves properly qualified for command. As a badge of honorable distinction, ‘SERVICE CHEVRONS’ will be furnished by the War Department to be worn by the Veteran Volunteers. VI. Officers of regiments whose term has expired will be authorized on proper application and approval of their respective Governors, to raise companies and regiments within the period of 60 days, and if the companies and regiments authorized to be raised shall be filled up and mustered in the service within the said period of 60 days, the officers may be commissioned of the date of their original commission, and for the time engaged in recruiting they will be entitled to receive the pa belonging to their rank. VII. Volunteers or Militia now in service whose terms of service will expire within 90 days, and who then shall have been in service at least nine months, shall be entitled to the aforesaid bounty and premium of $402, provided they re-enlist before the expiration of their present term for three years or the war; and said bounty and premium shall be paid in the manner herein provided for other troops re-entering the service. The new term will commence from the date of re-enlistment. VIII. After the expiration of 90 days from this date, volunteers serving in three year organizations who may re-enlist for three years or the war, shall be entitled to the aforesaid bounty and premium of $402, to be paid in the manner herein provided for other troops entering the service. The new term will commence from date of re-enlistment. IX. Officers in service whose regiments or companies may re-enlist in accordance with the provisions of this order before the expiration of their present term, shall have their commission confirmed so as to preserve their date of rank as fixed by their original muster into United States service. X. As soon after the expiration of their original term of enlistment as the exigencies of the service will permit, a furlough of 30 days will be granted to men who may enlist in accordance with the provisions of this order. XI. Volunteers enlisted under the provisions of this order will be credited as three year men in the quotas of their respective states. Instructions for the appointment of recruiting officers and for enlisting Veteran Volunteers, will be immediately issued to Governors as states. 1. Reports of Committees of the Senate of the United States for the First Session of the Fifty-First Congress, 1889-90. Washington, D.C.: Government Printing Office, 1890. This entry was posted in American History, Civil War, Military, Union and tagged American History, Army, Civil War, Fort Jefferson, Fort Taylor, History, Military, Pennsylvania, Union, Veteran Volunteers.